Ah, it’s Lent again! Are you giving anything up this year? Most of my coworkers, though not Christians, must know when Lent starts each year because they always ask me what I’m giving up. When they do this they often look at me like some strange, exotic animal who willingly put myself in a cage at the zoo. Its kind of….odd. At first I thought that this might be a good thing because usually after I tell them what I’m giving up, they usually ask me why in the world I would give up, oh, say candy and Coca-Cola, which is basically my life blood. Then I can talk to them about Lent and sacrificing and self examination before we celebrate Christ’s Resurrection. It’s a witness moment! But is it really? Maybe (probably) they just think I’m a weirdo. Now being a weirdo for Christ is perfectly ok. In fact I think I’ll start a new Twitter hashtag #weirdosforChrist. But is it possible that maybe over the last few years I’ve made Lent more about what I’m giving up and tracking my progress than about following Jesus on his journey to the Cross? Have I made Lent into a project? The idea comes from the book “40 Days of Decrease” by Alicia Chole. It’s a book that challenges the reader to not just give up coffee and chocolate for Lent, but to give up things like complaining or other negative actions or thought processes. On the first day she challenges us to give up Lent as a project. See, I’m a progress/achievement oriented person. In my job I have goals that I have to track each day, each week, and each month. Looking at the reports and checking off the progress makes my heart so warm that even John Wesley would be jealous (gratuitous Methodist reference). Tracking goals and evaluating performance is a project. According to Chole, we can end up looking at Lent like that too. How long did you make it before you cracked that first Coke open, a week? Did you make it all the way to Easter? How many pounds did you lose in the process? Did you actually manage to finish the devotional book? I realized that often my Lenten observances are just like that. I get so busy checking off the boxes along the way that I forget where Jesus is in the midst of all of that. I get so busy tracking the physical objective that I lose track of the spiritual journey. Which brings us to the reading above. Normally we don’t hear about this until Holy Week, but in her book, Chole picked this one for today. I think I see why, at least for me and what God wanted me to take from it. Chole asks the reader to insert themselves in the story and think about the sights, sounds, and smells that you might experience. So I entered into the story of Mary anointing Jesus at Bethany. I was reclining with Jesus, the disciples, and Lazarus, there at the table. I smelled the wonderful food that Mary and Martha had prepared and could taste the wine on my lips. I pictured myself taking to Lazarus about what it was like to be dead. I mean, come on, you wouldn’t? Out of the corner of my eye I see Mary enter the room. She walks up to Jesus carrying a huge jar of expensive perfume, which she proceeds to dump on the feet of Jesus. Then she dries his feet off with her….hair. That man is Judas. The scripture says the reason that he’s so upset is really because he wants to pocket some of the money for his own gain, but the disciples didn’t seem to realize that, so in this story, I don’t either. In fact, I actually find myself kind of taking the side of Judas, which is a bit of a tough thing to admit. Come on, we definitely could have sold that and used it for a better purpose. We could have used the money to give to the poor sure. We could have have used it to further our ministry in any number of ways. I found my thoughts drifting back into my own time. We could have used that for Family Promise. We could have used that to make up the shortfall in the budget. We could have put that into the building fund, we could have bought a year’s worth of Sunday School material or bought supplies for the church community garden. In short, I could plug that money into one of my projects. I sit down, baffled, unsure as what to say or even think. What does he mean? There will always be another project, another goal, and often those goals and projects are perfectly noble, some even give glory to God. But what if I’m so busy keeping track of my projects and my ministry that I forget Jesus, that I forget that my life is a journey of following him and emulating him? I do that. I do that a lot. *Human One is the Common English Bible’s rendering of Son of Man. 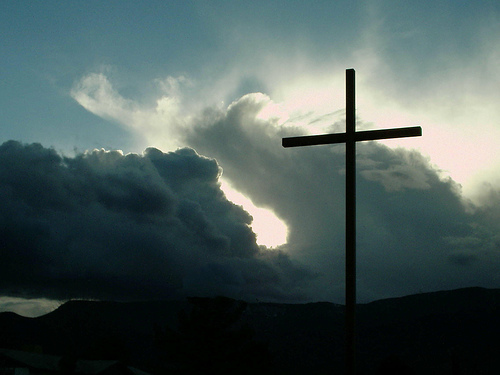 “A Way Other Than Our Own,” by Walter Brueggemann. Published 2017 by Westminster John Knox Press. This review refers to the paperback edition. A large number of the Christian authors that I read cite Walter Brueggemann on a regular basis, so I decided to finally go straight to the horse’s mouth and check out some of his writing for myself. I’m really glad I did too! Over the last few years I’ve had some terrific companions for Lent including NT Wright, Dietrich Bonhoeffer, and Adam Hamilton. This book is up there with those as one of the best devotionals I’ve ever read. The tact that Brueggemann often takes really strikes a chord with me right now, right where I’m at in my faith. He talks a lot about Christ versus Empire and Christ versus a consumerist culture. This tracks really well the “new monastic” movement of Shane Claiborne and others, something that also really touches my soul. Many of the devotions in this book move along those lines, encouraging the reader to disengage from the narrative of the the world, the rat race, if you will, and embrace the narrative of Christ, the road of peace. Brueggemann doesn’t promise that taking this path will be easy. It requires submission and obedience to Christ as we truly travel “A Way other than our own.” While not easy, traveling this way with Jesus can result in fulfillment and a great sense of peace as we seek to better be the people He wants us to be. Sometimes my concern with these kinds of books that ask us to step away from the world for a moment give me pause. I think there can be a fine line between choosing to just walk a different path IN the world and totally disengaging from the world, which I don’t believe that this is what God asks us to do. However, after reading through this devotional I can firmly say that while Brueggemann certainly advocates that we march to the beat of Christ’s drum, we continue to march in the world as a faithful witness. I had really wanted to do much more of this “Characters of Lent” series, but a two week battle with the flu has had me pretty much stuck in bed until the last couple of days. So now in the last few days of Lent and Holy Week I want to come back and look at some of the folks in the story of Christ’s last days. You can also look at my first entry in this series about Peter. Today I want to look and Pontius Pilate, who was prefect of Judea from 26-36 C.E. Most of what we know about Pilate comes from the New Testament and the retrospective writing of the historian Josephus. That had caused some historians to question whether or not Pilate ever existed. Well in 1961 a damaged stone block was found in Caesarea Maritima with an inscription mentioning Pilate. Both the stone and the inscription date to Pilate’s time. Today the “Pilate Stone” is on display at the Israel Museum in Jerusalem. Let’s put ourselves in Pilate’s shoes in the Holy Week story. Rome was occupying Judea by force, and the locals resented it. As Prefect, Pilate’s job would have been to try to keep an uneasy peace in the territory and also squash any threats to Roman rule. Sound like a tough job? You bet it was. Less than 40 years after Pilate left Judea, Roman legions came in and destroyed the city of Jerusalem and the Temple. Tensions were high between occupier and occupied. You had probably heard about the events that had happened just a few days ago when a bunch of Jews hailed a dirty rabbi riding a donkey as their King. However, despite the fact that this rabbi had caused a stir in the Temple courts, he seemed harmless, walking around preaching about non-violence. So it’s early Friday morning and one of your centurions wakes you from a sound sleep telling you that the Jewish High Priest was outside with a problem. Seriously? You tell the centurion to bring him in, but then he reminds you that the High Priest won’t come in because entering your house would make him unclean for the Passover. Ugh. Reluctantly you go outside to meet Caiaphas and his followers. The temple guards are restraining a man who looks like they just yanked him away from sleeping on the streets. Caiaphas tells you that this man is very dangerous and demands that you put him to death. You scoff at the priest and tell him to go deal with his own problems. Blasphemy against the Jewish God is no concern of Rome. Then Caiaphas plays his ace. He tells you that this man claims to be a king, and anyone who claims to be a king is no friend of Caesar’s. You gaze at the man. Could this be the man that the Jewish people were singing about? Could this be the man causing problems in the Temple? He sure doesn’t look like much of a king! You have this man, this Yeshua, brought to the Praetorium. The light of the morning is just starting to filter in as you take your seat to question him. The man stands in silence. Maybe he’s just crazy. You ask him again. Those words will echo in your head for the rest of your life. You ponder this man and finally ask, “What is TRUTH?” The man, Yeshua, gives no answer. What do you do? Do you let him go and dismiss him as a crazy man? Do you denounce him and have him put to death to appease the crowd? Do you find some way to pawn the choice off on someone else? We are each confronted by this Simple Rabbi in our lives. He claims to be a King, to offer something different and better, something not of this world. He tells you that he is the Way, the Truth, and the Life. Well, what is truth, and what will you do when you are confronted by this man? Will you dismiss him as crazy? Will you denounce and reject him because that’s what the crowd desires? Will you try to find an excuse not to believe, and hedge your bets? Or will you see the light in the darkness, the light that is the life of all people? The answer to those questions are yours alone. What will you do when you sit and evaluate this claim? I pray that you will accept the grace and mercy offered by Yeshua, and that’ll you’ll follow him. If you have already made that choice, please realize that each of us is still confronted by Christ on a daily basis. Each day He is present not only in our family, friends, and church communities, but in the homeless man on the corner, the sick person in the hospital, the victims of war and violence, and even in the convict in prison. What will you do when you are confronted by Christ in these ways each day? In my last entry about Adam Hamilton’s book “24 Hours that Changed the World” I mentioned that since Hamilton encourages us to see ourselves in the characters of the story of Holy Week and the Passion, I was going to do a series where I do just that. This is the first of the series, and I’m going to reflect on Peter. That’s a pretty good endorsement, isn’t it? Jesus seemed quite confident in Peter, and of course Peter was supremely confident in himself. 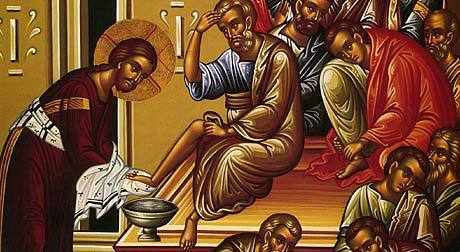 Late that night on Holy Thursday, as Jesus and the disciples ate the Passover meal, Jesus had predicted that all of the disciples would fall away, and Peter told him that even if all the others fell away, he would not (Mark 14:31). Imagine Jesus looking Peter full in the face, making direct eye contact, and saying, “Peter, before the rooster crows twice tonight you will deny me three times.” Put yourself in Peter’s place, having Jesus just staring into your soul. What could he possibly mean by that? What in the world was going on? After dinner you all go out to Gethsemane to pray. Jesus asks you, James, and John to stay awake with him because he is troubled “to the point of death.” What in the world is wrong with Jesus? You’ve never seen him quite like that. Jesus goes off by himself, as he often does, and you sit with James and John. You talk a little bit, maybe about how great your dinner was. Maybe you discuss some of the odd things Jesus had said at dinner, you know, about the bread being his body? Had you heard him right? Soon the wine starts to kick in, and it is rather late so you find yourself nodding off to sleep. After a few minutes, Jesus comes and shakes you awake. He looks like he has been weeping, eyes bloodshot, his face coated with sweat and tears. “Peter, couldn’t you just stay awake with me this little while?” You don’t want to make a scene and rouse the others so you whisper something like, “It’s ok, Jesus, I’ll stay awake, I got this.” Jesus saunters off again, and you fall asleep, only to be woken by a distraught Jesus again. A third time you fall asleep and then awake to see Jesus standing over you, gazing across the Kidron Valley. You rub the sleep out of your eyes and see a group of men carrying torches and chains approaching, and is that, can it be, Judas with them? You’re confused, but the confusion turns to anger quickly. Judas walks up to Jesus, and kisses him, and after that you see members of the Temple guard surround Jesus and start to bind him. You’re not going to take that laying down, so you draw your sword and strike the man nearest to you, removing his ear with one swipe of your blade. Jesus looks at the scene, and shakes his head. Not yet totally bound, he picks up the ear of the man and places it back on his head. He says, “Peter, put your sword away, for those who live by the sword will die by it also.” You stand there, stunned and confused until the captain of the guard walks up, grabs your sword and tells you to leave or you will share the same fate as your master. You turn and see all the others running in opposite directions. Not sure what to do, you follow them, not daring to look back as they haul Jesus away. After a few moments you gather your thoughts, and you realize that since it was Temple guards not Romans, they must be taking Jesus to the palace of the High Priest. You follow from a distance, then flipping up the hood of your cloak you sneak into the courtyard, trying to get a glimpse of Jesus or at least figure out what’s going on. And then you hear a shrill sound, piercing into the fabric of your being. A rooster crows once, and then again. You get this knot in the pit of your stomach and you glance across the yard only to Jesus being led from the High Priest’s chamber. His eyes meet yours and he holds your gaze for what seems like an eternity. He knows. He knew then, and he knows now. You run from the courtyard, weeping uncontrollably. I get Peter. I really do. Years ago when I thought I was going to be a pastor I thought I had it all figured out. I was supremely confident in my faith and in my abilities, but like Peter, my fall was sudden and violent. Some things happened in my life, some things went against me and I began to question. This made people interested, knowing that I had wanted to go into the clergy and they would ask me: “I thought you were a Christian?” My response, “No, I do not know the man.” I denied him more than I like to admit. But a funny thing happened while I was down on myself, my faith, and my world as a whole. God never gave up on me. One night I was listening to my favorite atheist podcast and they were interviewing a guy named Brian McLaren. Here was this man talking about how Christians and how the church really weren’t this group of annoying blowhards that were just out to make everyone miserable. In fact, many Christians were gravitating away from the that toward a message of piece, love, and grace. Grace. There’s that word. The grace of Christ allowed Peter to not only be reconciled to Christ but to be one of the most instrumental people in the founding and sharing of the Christian faith. If Peter could receive that kind of grace, then, could I? I had a similar path to Peter’s. I went from supremely confident, to denying that I even knew Jesus, to being devastated and looking for a way back, which I found in the Amazing Grace of Jesus Christ. That grace is available to you as well. And that my friends, is why I so easily see myself as Peter in this story. “24 Hours That Changed the World” by Adam Hamilton. Published 2009 by Abingdon Press. This review refers to the hardcover edition. Next to Brian McLaren, Adam Hamilton is by far my favorite author writing to Christians today. His works constantly enlighten, challenge, and enrich my faith. This book, though it is one of his older works (2009) was really no exception. Whether you’re a Christian or not, whether you believe these events actually happened or not, it’s pretty much undeniable that the events that took place in the roughly 24 hour period between Christ’s last meal with his disciples and his death the following day did indeed change the world. Belief in these events would spring a new faith into being that would be a driving force in shaping human history over the next 2000 years, and it’s still happening today. For Christians, these events not only are the founding moments of our faith, but we believe that they not only influenced written history, but they give each and every one of us a chance to change our destiny, both in this life and the next. We believe that through the suffering, death, and resurrection of Jesus that we have been reconciled to God in a new covenant that allows us to be in communion with him. Hamilton explores these events, and the theology of how exactly this works, in great detail throughout the book. Starting with the Last Supper, Hamilton takes the events of the final day of Jesus’ life and works through them one by one, culminating with his death on Good Friday. After that he adds another chapter on Easter. Two themes run through all of these chapters. First, Hamilton invites his readers to place themselves in the story, in the the roles of the various characters. Maybe you’ve participated in a Passion reading at your church or a procession of the Stations of the Cross and you’ve pictured yourself as a member of the crowd condemning Jesus or watching him carry his cross. Have you ever put yourself in the shoes of Judas, Barabbas, the Roman soldiers who flogged Jesus, or even Pilate himself? Trust me, to do so is a, shall we say, enlightening experience and I believe that it can be a very powerful experience if you let it. I’ve finished the book, watched his DVD, and I’m going through his devotional guide, so I’ll be posting some reflections along these lines in a new series here on the blog throughout the rest of Lent. The other theme Hamilton delves into is the question of how exactly the Atonement works. The first theory suggests that while Jesus was hanging on the cross the Father placed the weight and guilt of all the sin of the world on the Son. Then, because the Father is purely Holy, he had to look away from Jesus because he could not stand to see the sin, which is paid for by the death of Christ. The second suggests that Jesus substitutes his death and punishment for our own. The third theory, often called the “moral influence theory” states that the story of what we as a sinful people did to Jesus, the innocent man, is meant to be so shocking, so horrible, that we decide to change the way we live and follow his path. The final theory, “Christ the Victor” or Christus Victor in Latin, states that we must not only focus on the suffering and death of Jesus in the Atonement, but we must include the Resurrection and take all three as whole and view it as Christ ultimately conquering sin, death, and evil: once and for all. I must admit that while I see different merits in each argument, I prefer “Christ the Victor” because it offers the most HOPE. Yes, hope. I think that is one of the most important things we can grasp as Christians. I’ve had the honor of being liturgist at our church on Easter Sunday before, and I get to do it again this year, and there’s something special about being able to stand on a spring day among the Easter Lilies and proclaim the Good News, and Blessed Hope of the Resurrection of the King. It gives me chills just thinking about it. If you’re looking for a book to supplement your Lenten journey, or if you just have a general interest in the theology around the Atonement, I’d encourage you to read this book. I think there’s something here for Christians of all stripes and I look forward to reading it again in the future. That’s a great quote. Where I live, in Utah, it’s easy to feel “special” or unique on Ash Wednesday. Most of the population here belongs to a different faith, and sporting a cross of ashes on one’s forehead is a pretty surefire way to get some weird looks. After our Ash Wednesday service, many people from our large Methodist church go to a local restaurant for dessert, and we’re often joined by some folks from one of the local Catholic churches. It can be a bit of a shock for other folks who are there, and if you’re not careful, you kind of bask in the “look at me, look how holy I am” attitude. Yuck. But that’s really not the idea behind Ash Wednesday at all. It’s not about slapping some ashes on your forehead and being PROUD of it. It should be the exact opposite, actually. We are sinners. We constantly fall short of God’s expectations of us, and this is a time to remind ourselves, and our community, of that very real fact. 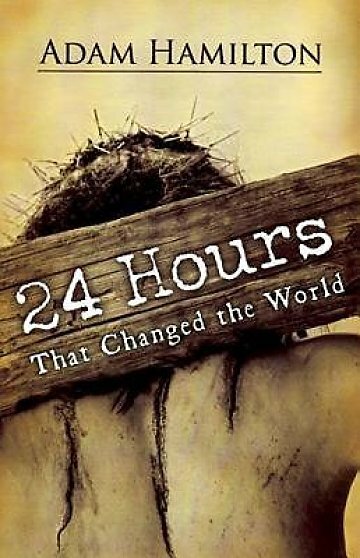 For my Lenten devotions this year I’ll be doing Adam Hamilton’s “24 Hours That Changed the World Devotional” focused on the last 24 hours of Christ’s life. In the book that accompanies the devotionals, Hamilton constantly urges us to see ourselves in the story in the roles of different people: Peter, Judas, John, Pilate, Barabbas, and even the Roman soldiers who tortured and mocked Jesus. That’s right, even the Roman Soldiers. That sounds a little extreme though, doesn’t it? Picture those guards beating Jesus with a whip, probably a whip with multiple lashes embedded with metal, bone, or stone shards that not only bruised but tore flesh from the victim. Imagine hitting him in the face, or placing the crown of thorns upon his head. This man who was meek, loving, and gentle, who never hurt anyone and who healed many, and you’re just going to town on him. You couldn’t do that, right? I couldn’t do that, right? I don’t know, perhaps we should consider that for a moment. Look at how many people turned out in droves yesterday to vote for Donald Trump, a man who is unabashedly sexist, racist, and utterly hostile to anyone who disagrees with his extreme positions. Exit polling data showed that 66 percent of Republicans who voted in the New Hampshire primary were in favor of banning Muslims from entering the United States. Seriously, 66 percent! People have been openly mocked and some beaten at Trump rallies. Think about the Nazis. Do you really think that each and every one of them was evil to the core? What about the guards at places like Auschwitz? Were they born hating Jews and wanting to kill them, was that bred into them? Of course not, yet they were capable, and the truth is that we are all capable of doing some pretty bad things given the proper circumstances. Ordinary people can be persuaded to do extraordinary and awful things. Given the right combination of ideology, authority, and gradual desensitization, all of us can become monsters, capable of destroying others with weapons ranging from words to gas chambers. It is a reality we must face and guard against, looking instead to God and trying to understand who He has called us to be. That’s part of what Ash Wednesday and Lent is about, reminding ourselves that we are sinners, and that we are capable of doing some very evil things. Through examination and the grace and power of Christ, we can guard against that and hopefully set ourselves on the path to more fully realizing God’s deepest dreams and desires for us as his people, called by His Name. So maybe you won’t go take the ashes today, but even if you don’t, try to see yourself in the role of the Roman Guards, of Judas, of Pilate and think about how you act in the world around you. What should you do differently? What habits need to be changed? What is hiding in the deepest, darkest part of your soul? Lent invites us to let the light of Christ shine in and help us examine and better ourselves, if we just let it. 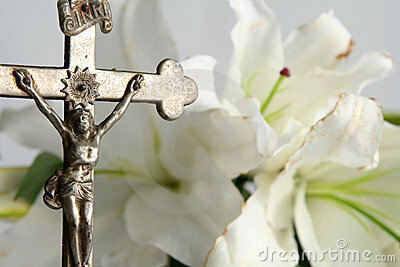 May you have a blessed and fruitful Lenten observance, and may the peace of Christ dwell with you all. 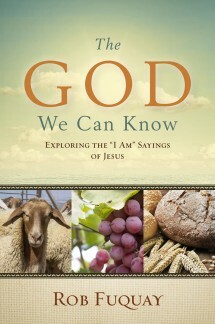 “The God We Can Know” by Rob Fuquay. Published by Upper Room Books, 2014. We used this book for our Lenten study in our church, both for our Adult Sunday class, and in the main service as well, with Pastor Gary using it as the basis for his sermons during Lent. The book covers the “I Am” sayings of Jesus as recorded in the Gospel of John, as well as introductory chapter on “I AM” as the name of God from the Old Testament. It really was quite an excellent book. Pastor Fuquay’s style easily reminds the reader of someone like Adam Hamilton. It’s easy to read, which really gives people the chance to interact with the themes and ideas presented. Even some of the most thorny theological material is presented in a light that invites you to wrestle with the idea itself instead of just going over ones head. My favorite chapter in the book was probably the Chapter on Jesus as the Good Shepherd. It was already one of my favorite metaphors in scripture, but reading the information provided by Fuquay as background into the role of a Shepherd at this time strengthened that even more. It was also one of the most comforting things that I’ve read in a long while. There is also a DVD study that is available for this as well. In each session, Pastor Fuquay visits different places in the Holy Land that are connected to these “I Am” sayings. He goes from the Temple Mount in Jerusalem, to a beautiful vineyard, to the tomb of Lazarus, and to many places in between. Fuquay himself provides more unique understanding in the video segments, and they are beautifully shot and produced. Our group got a lot out of it and I highly recommend purchasing it if you choose to do the study in a small group setting. The book’s length and the final chapter on “The Resurrection and the Life” make it an ideal study for the season of Lent and Easter Sunday, but it isn’t necessarily billed as such. It would make an excellent study at any point in the church year. I also think that pretty much any individual would get something out of it just reading on one’s own as well. A couple of last notes: If you are going to use it as a whole church study, I would recommend having your adult class or small group discuss the topic before it features in the service or sermon. Our adult class meets after the service, and a couple of times some folks thought that there wasn’t a lot left to say on some of these after the Pastor had already covered the topic in his sermon. Also, there were a couple of people in the group who thought that while the information presented was interesting, they thought that overall it was a little on the simple side. I didn’t necessarily think so, but it was an opinion voiced in our group, so it’s possible that in a more advanced or deep thinking group, this opinion might spring up as well. For weeks Christians around the world have been on a journey. This journey leads us down a path of exploration, of sacrifice, of strong emotions. The self examination that can be done during Lent can shine a light into our darkest places, where our secrets and our innermost feelings and fears are laid bare. Maybe you’re one of the few people trying to save him. Maybe you’re trying to talk some sense into the crowd. You’re fighting your way to the front, where your voice might be heard by Pilate. “No! Release Jesus, this man has done nothing wrong! You’re being tricked and lied to! Let him go!” Someone in the crowd doesn’t like your plea, and sucker punches you in the stomach, dropping you to the ground. As you start to get yourself together the crowd cheers and you look up, seeing the soldiers pushing Jesus out of view….off to be crucified. The crowd reforms on the street and you see Jesus carrying his cross to the hill of The Skull. The crowd is yelling many things, nearly all of them unimaginable insults. People spit on him. Someone breaks through the line of soldiers and pushes him to the ground, the heavy wooden beam falling on his back, crushing into him and ripping into his skin. The crowd laughs. The soldiers laugh. You run into the path and try to help him. As you attempt to lift the wood from him, he looks up at you. He’s breathing hard, sweat and blood pouring from his brow where the thorns gouge his scalp. He speaks no words, but his eyes…..what do you see in his eyes? Just then you hear a voice behind you. “Out of the way or you’ll be next!” You turn just in time to see a wooden club brought down on your head. You come to a few minutes later, your head pulsing with pain, feeling like someone is beating a drum in your brain. Then you start to realize that you’re hearing a real sound. You’re hearing a hammer pounding large nails. And you hear an otherworldly scream each time the hammer drops. How did it come to this? He healed so many. He raised people from the dead. How could this have happened? What could you have done to prevent it? You find your mind grasping at straws in an attempt to answer these and other questions. You don’t know how long you’ve been standing there, but you’re driven back into the present by a loud crack of thunder. You look around, wondering when it got so dark, it’s only about 3 o’ clock! The earth shakes under your feet as the crowd around you starts to panic. Even the Roman soldiers seem to have a bit of an anxious look on their faces. Then he speaks three final words that pierce into the sky, into your soul, and into the souls of everyone around you.